There are few things in the world more romantic than staying in a luxury castle. 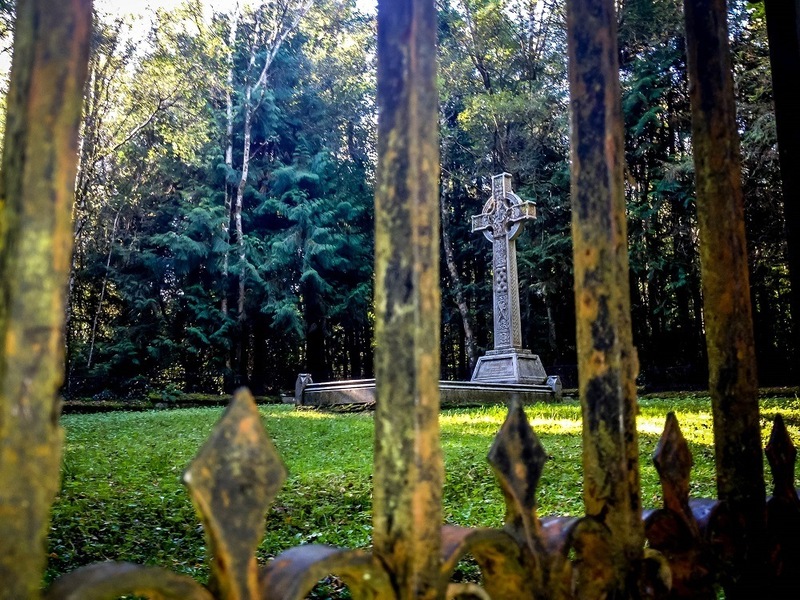 This is usually at the top of the list for many visitors to Ireland. We came into Donegal County on the back of a strong autumn breeze. As we approached the Lough Eske Castle Hotel, the wind was whistling through the trees and whipping up small whitecaps on the lake and a damp coolness hung in the air. We enjoy planning our travels and we chose this castle hotel because of the juxtaposition of two images on the Internet: the ruins of a crumbling castle with a tree growing up through the center of it contrasted with the second image of a gorgeous castle lovingly restored and the sun setting on the salmon-colored sandstone. Somehow, these images captured my imagination and I wanted to take Laura here for a romantic getaway during our Ireland trip. The Lough Eske Castle traces its roots back to 1474. 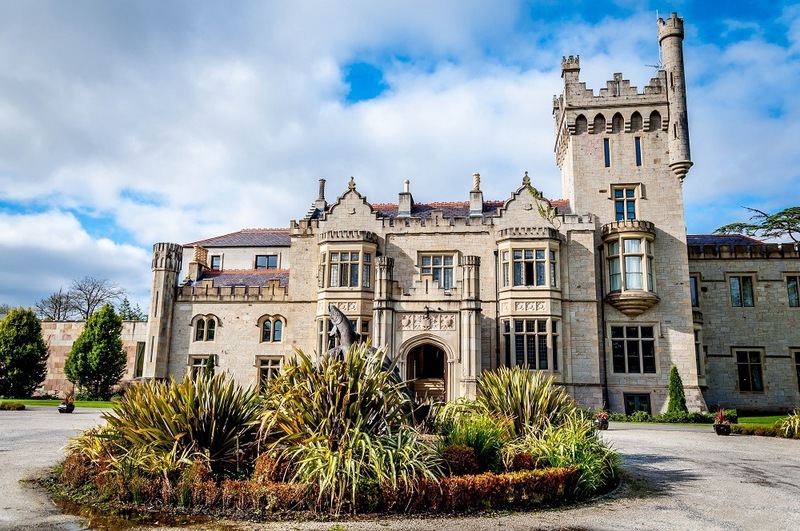 The current castle was re-built in 1861 and was lovingly restored and re-opened as the Solis Lough Eske Castle Hotel in 2007. The castle is both intimate and grand at the same time. The public spaces are divided with stone archways, stairs and pillars closing in the public spaces and adding warmth to the charming old castle. Leaving the lobby, you enter your bedroom, which is absolutely gigantic! We were determined to make the most of our stay. After checking into our room, we headed over to the spa, where we had a reservation for a couple’s The Real Aromatherapy Massage. We enjoyed our side-by-side messages, complete with relaxing lavender. A week into our travels, we needed the massage for relaxation and rejuvenation. My masseuse Olivia’s hands gently kneaded those kinks out of my body. It was sublime! In the morning, before leaving the castle, we took part in one of their activities – fish smoking. Anglers can catch their own fish and then work with their catch. We’re not fisherman, so we used one of the hotel’s fish. The chef taught us the secrets of unlocking the fish’s flavor before carrying it out to the smokehouse. We were able to enjoy a nice bottle of wine and fresh smoked fish before leaving for the day. 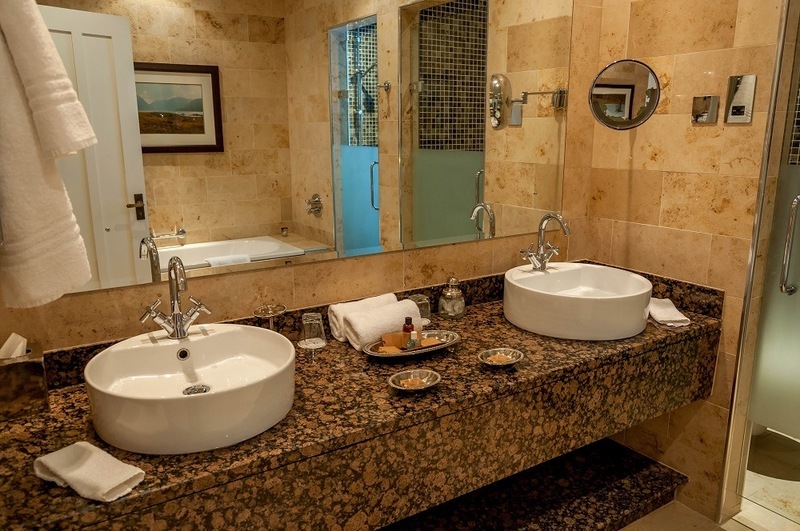 The entire hotel conveys class, selectivity and romance. During our stay, we saw two different couples get engaged in the hotel lobby. 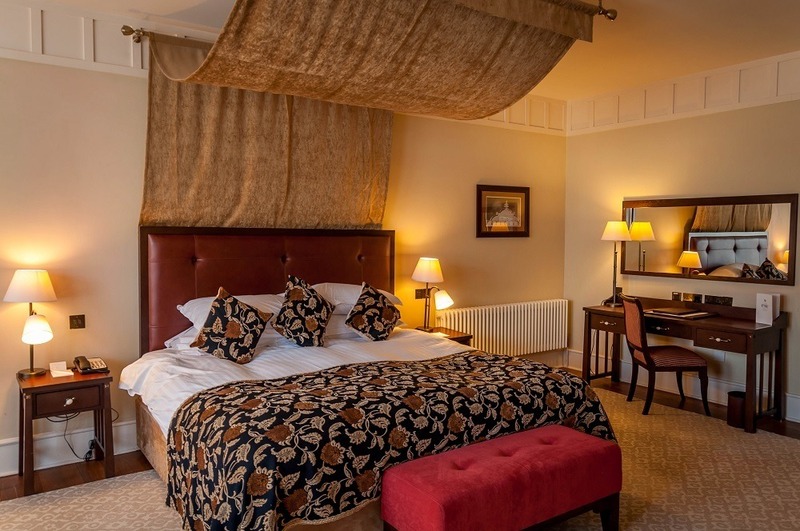 Lough Eske Castle is that romantic! It is easy to see how this has been consistently named the World’s Best Luxury Country Hotel. The HotelThe Restaurant: The main dining room is called The Cedar Grill and features classic fine dining with locally sourced ingredients in a casual sophistication. For dinner we each had the seasonal salad with local vegetables and the steak with red wine sauce – perfectly prepared. Nothing could be more romantic than ending with a chocolate fondant. 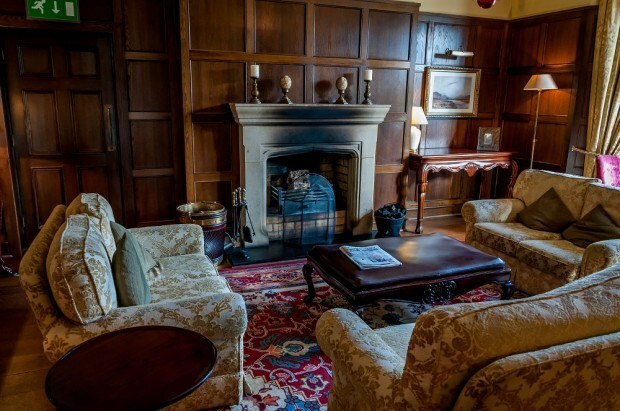 The Lounge: The Oak Bar is the perfect place for an afternoon indulgence or an evening nightcap. We love great bars with lots of ambiance and the Oak Bar offers it in spades – you just want to curl up in one of their big chairs with a beverage. The Concierge: There is not a dedicated concierge desk, however, the front desk was well versed in providing directions and assistance. 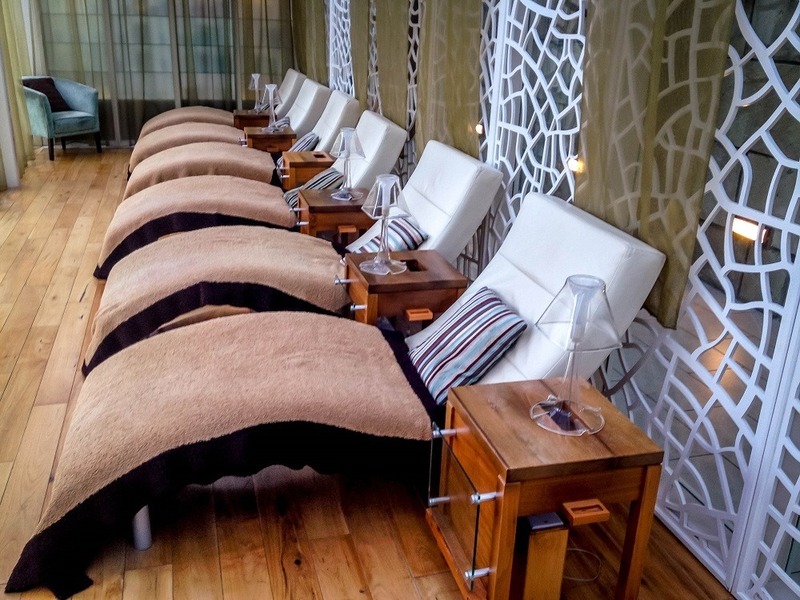 The Spa and Recreational Facilities: The Spa Solis was the highlight of our stay. 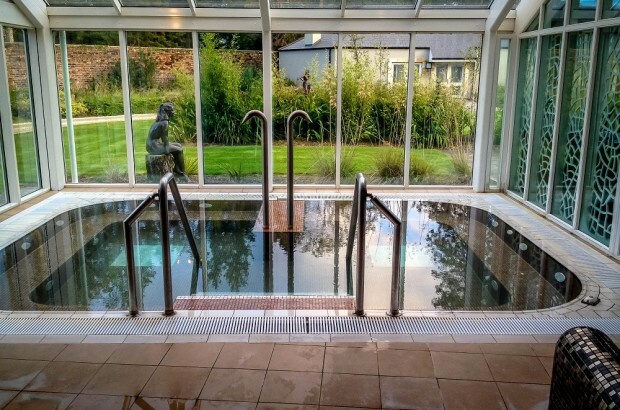 The massive spa complex has a 12m lap pool, an exercise room, a whirlpool and sauna along with numerous treatment rooms. We found we could spend hours here just relaxing. The Bed: In our experience, most hotel beds in Europe are a bit on the firm side. However, the bed at the Lough Eske Castle Hotel had a pleasant softness to it and was probably the most comfortable bed of our entire trip. The Rooms: Our bedroom was huge and had a large sitting area. Despite being located on the main hall just two doors down from the front desk, our room had absolutely no noise from the hallway or from outside. The room was completely quiet. The WiFi: The wifi worked like a champ around the whole property. The Television: There was a huge television in our sitting room and another smaller TV in the bedroom, although we didn’t turn them on. The Safe: We did not notice a safe in the room for the valuables, but we also didn’t look. The Bathroom: The bathroom had two large sinks with a large soaking bathtub opposite. The toilet was in a separate nook with glass door. There was a huge walk-in shower for prolonged soaking! The Bathroom Amenities: There were ample towels. We also had bathrobes to walk to the spa or lounge in the room. The Hair Dryer: They had a working, handheld hair dryer with lots of power – important for Laura. The Location: Located in the woods about 15 minutes from the center of Donegal town. The lake is a short 10 minute walk from the castle. The Transportation: Given the remoteness, public transit is not possible (or if it is possible, it is certainly not recommended). There is ample on-site parking and the hotel will valet your car if you are staying overnight. The Airport Transfer: The hotel is fairly remote. The hotel is approximately 70km from Donegal airport (CFN) and 117km to the international airport in Knock (NOC). 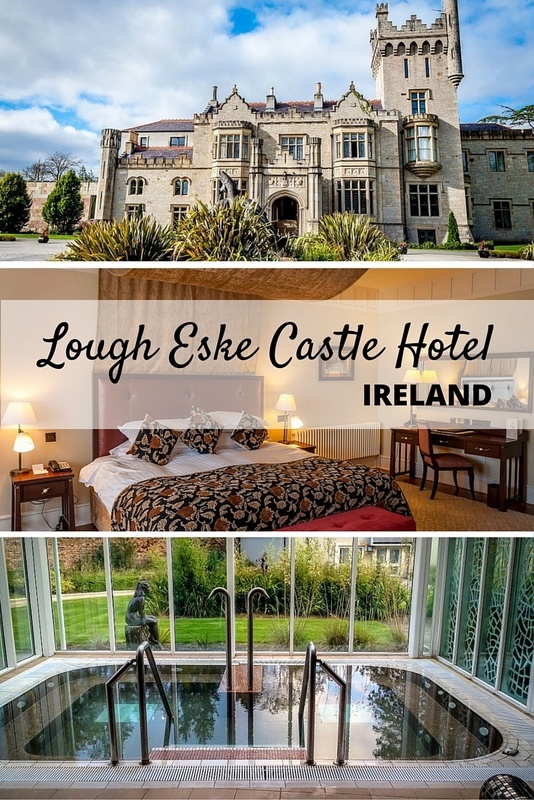 The Lough Eske Castle Hotel is probably the most romantic hotel experience we’ve ever had and we would absolutely visit again. 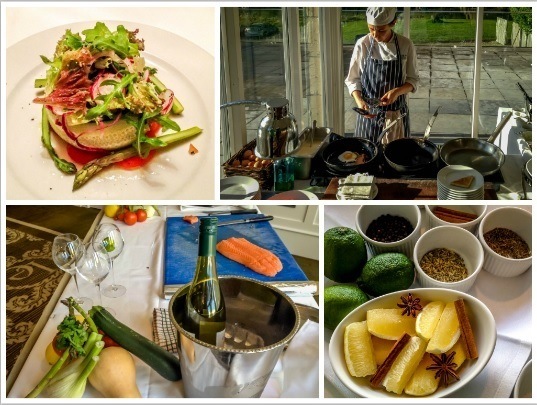 We were the guests of Solis Lough Eske Castle Hotel. As always, all opinions of the luxurious, delicious, and relaxing are our own. Note: Some links may be affiliate links, which means Travel Addicts may earn a few pennies if you buy something, at no additional cost to you. What do you think about Luxury at Solis Lough Eske Castle Hotel in Donegal? Great post. I stayed at Lough Eske as part of a wedding help there. We checked in late and were upgraded to the President’s Suite! I have a review and pictures on my blog. I enjoyed reading your experience because you took the time to experience the whole castle. I was busy attending the wedding festivities, so I did not check out the spa. Donegal may be overlooked by many tourists, but I just enjoyed the landscape! Thanks Angela. 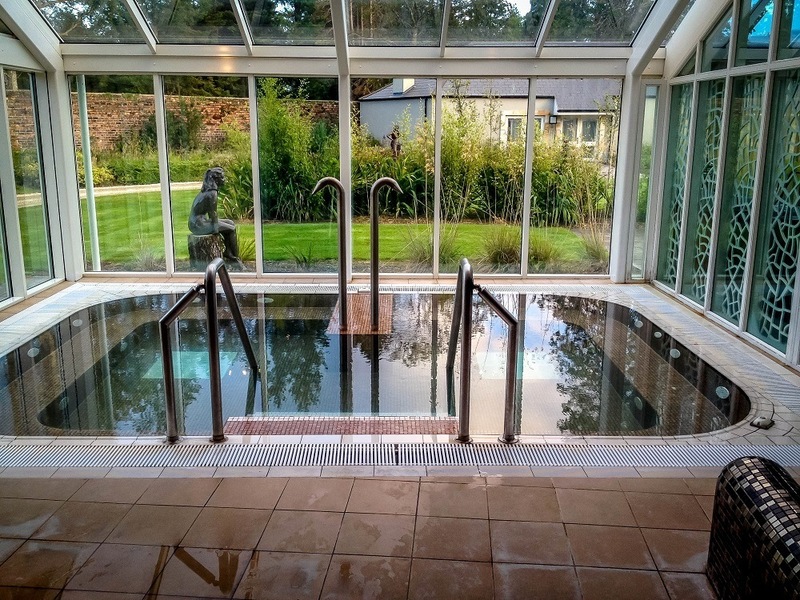 We completely agree – Lough Eske was fabulous! I’m jealous of the Presidential Suite! This looks amazing! It seems like the kind of place that would be worth giving up my usual hostel stay for a weekend of luxury. I might actually consider it if I’m around that part.